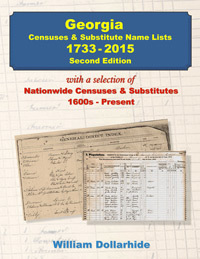 Details: Georgia Censuses & Substitute Name Lists 1733-2015; PDF eBook, by William Dollarhide; 88 pp., PDF (download only) edition; 105 pp., paper; 8.5x11; ISBN: 978162859198-9; Published: 2018; Downloads are available immediately upon placing order; Item # FR0230-2. This new Second Edition includes 255 Georgia State URLs, of which 30 are catalog and reference links. The rest of the URLs link to databases. Three Hundred Thirty-Five National URLs are also included. There are an additional 17 pages in the Second Edition (as compared to the First Edition). This book is also available in a paperback printed format..
Map: 1790 Map of Georgia.